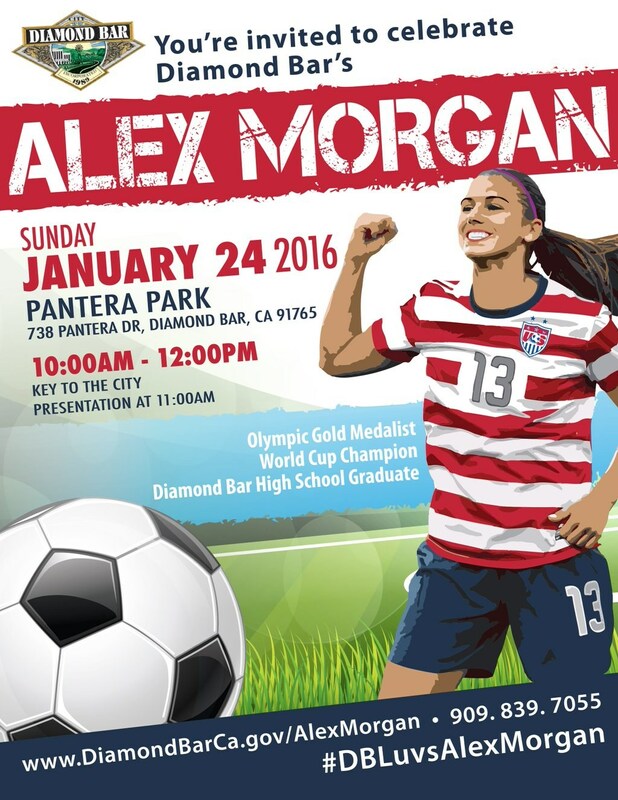 On Sunday, January 24, the City of Diamond Bar is hosting an event in honor of Diamond Bar High graduate, professional soccer player, Olympic Gold Medalist, and World Cup Champion, Alex Morgan. At the event, the City Council will present Ms. Morgan with its inaugural Key to the City. The morning’s activities begin at 10:00 a.m. with giveaways for children in attendance and formal presentations taking place from 11:00 a.m. to noon. It is an outdoor event and will take place at Pantera Park, 738 Pantera Drive. As you can imagine, the Council is very excited to be able to congratulate Ms. Morgan in person for her many accomplishments as a soccer player, author, and as a positive role model for young girls with the same aspirations.